Every year, paint companies release their predictions for the upcoming year and what will be the popular new paint colors among customers for the new year. They typically base these predictions on the paint colors that are selling best. This information is extremely accurate because paint companies are able to keep record of various shades that are being purchased by customers. All of this information is collected and when reviewed they can precisely predict the most popular paint colors that are on the horizon. This is exciting in many ways. Especially, for homeowners to make the best decision to keep their homes and spaces up to date. The other great thing about paint forecasts is the can come as a range of colors that compliment eachother nicely. This allowing the consumer to have options within a certain shade of paint color. This also allows the colors of a home to flow well together, creating a very well thought out painting project within a home. The amazing color palettes will help a consumer to make a decision about colors that transition seamlessly throughout the home. So let’s get to it! What are the popular new paint colors for 2014? Here they are from both Sherwin-Williams and Benjamin Moore! 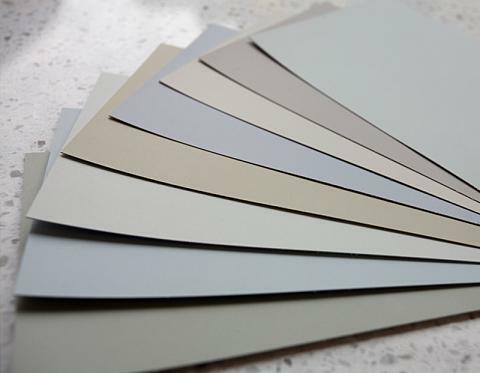 The first color palette that will be most popular in 2014 is a Gray Scale including colors such as: Classic French Gray (SW 0077), Tricorn Black (SW 6258), Extra White (SW 7006), Gauntlet Gray (SW 7019), Agreeable Gray (SW 7029), Crushed Ice (7647), Earl Gray (SW 7660), and Peppercorn (SW 7674). The second color palette from Sherwin Williams is named “Curiosity” and includes various shades that leave ones mind to fascination and want. These shades include Blue Peacock (SW 0064); Anew Gray (7030); Show Stopper (SW 7588), a joyous shade of red; and Quixotic Plum (SW 6265). The first palette from Benjamin Moore is referred to as a “new” neutral palette. From their findings they found that more neutral shades will be popular in the home. Benjamin Moore discovered there will be a shift to softened pastels in greens, lavenders, pinks, and blues versus Sherwin-Williams’ Gray Scale. Some of their recommended colors are Van Deusen Blue (HC-156), which has a strong shade of blue; Flint (AF-560), this contributes understated sophistication; and Breath of Fresh Air (806), a pale sky blue. Moore also suggests a color palette that includes the three colors Lavender Mist (2070-60), aforementioned Flint, and Peach Parfait (2175-70). These color palettes that both Sherwin-Williams and Benjamin Moore have predicted, are simply suggestions to help modernize and update homes. Of course, it really comes down to personal preference. But for some, suggestions are always nice. Let our paint professionals help you to make a decision that you won’t regret. Call us today!